November 6, 2017 By heather Leave a Comment This post may contain affiliate links. Read my disclosure policy. 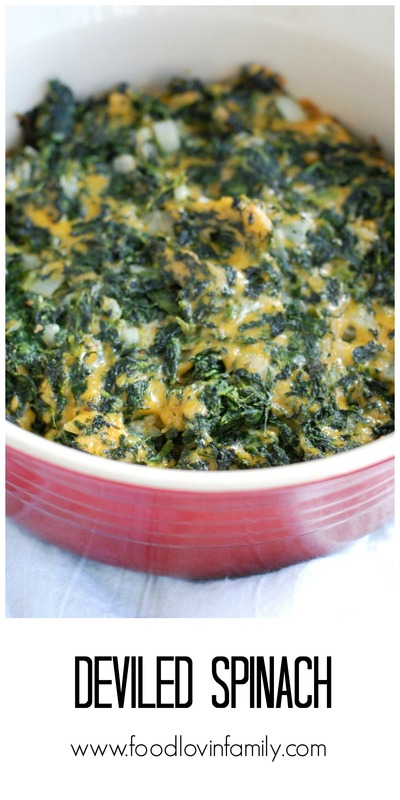 Deviled spinach is a slightly spicy, creamy, cheesy side dish. A great dish to serve during the holidays! Deviled spinach is staple in our house for the holidays. We also call it spinach casserole. Can you believe Thanksgiving is right around the corner. It is one of my favorite holiday because it involves being with our loved ones and of course eating delicious food. Sometimes I feel like it is one of those holidays that gets overshadowed by Christmas. The stores are already decorated for Christmas and I even saw a Christmas commercial on TV the other night! Every Thanksgiving my mom makes this deviled spinach. It’s kinda her “thing”. This dish is always the one thing we request be present at our Thanksgiving table. Deviled spinach is a little different from creamed spinach in that it has a slight spicy heat and the recipe uses sharp cheddar cheese. This recipe is also great to use as a spinach dip. Just follow the recipe and use some crusty bread, vegetables, or crackers to scoop it up. For this dish, I use frozen spinach. Make sure to thaw it out and then squeeze the excess liquid into a bowl. You will use some of the reserved liquid to thicken the mixture. Saute onion in butter and then stir in flour and add in reserved liquid and milk. Stir the mixture until it thickens and then add in spinach, cheese and spices. Transfer to a baking dish and bake for 30 minutes. What are some of your favorite Thanksgiving foods? I have too many to name. 🙂 Hope you enjoy this deviled spinach as much as we do! Thaw spinach and squeeze dry, reserving 1/2 cup of the cooking liquid. Melt butter over low heat in saucepan. Add onion and saute, stirring often for 2 minutes. Stir in flour, stirring until absorbed. Stir in liquid from spinach and milk. Stir over low heat until thickened, about 5 minutes. Remove from heat and add spices, spinach, and cheese. Combine well and place in a greased baking dish. Bake for 25-30 minutes until cooked through. If you do not like spicy foods feel free to leave out the cayenne pepper.